The adventures of His Highness' supernatural agents Art, an artificial ghost only a few days old, and her partner Jim, an animated skull, continue. And I couldn't be more pleased. This time, while Art is still recuperating from the re-animationist case, she and Jim must deal with a bone stealer who uses his rather unique gift to remove and insert bones into another and adhere skin, muscle, tissue, and nerves without permanent damage - except to the one who unwillingly donates his or her bones. I was delighted by the first book in this series. (Read my review of Risen here.) So, I was expecting to enjoy Bones as well. What I was not expecting was to absolutely fall in love with it! From the artwork to character development to the beautiful Victorian London scenes, it was impossible not to love this novel. I know Elizabeth Watasin did a great deal of research for this novel, but I have a feeling that she actually lives and breathes this era, that she sees airships when she looks up and carts and hansom cabs on cobblestone roads when she looks around. The pace was perfect. We get to know more of not only Art and Jim, but the other characters as well. I was surprised, however, when the conclusion of the bone stealer case is revealed, for it seemed too soon. But, it made room for us to get to know some of the characters even better when they are not under the pressure of solving a case. And for that I'm grateful. I admit I am most fascinated by Jim Dastard. As an animated skull with phantom limbs, his manner of speaking is honest and, at times, funny, once referring to Art's "Quaker tantrum." I was especially amused by the nausea in his phantom organs, and subsequent vomiting of coins, cigarettes, tobacco, and the like. The introduction of Delphia, Jim's new "legs" was an enjoyable addition to this novel. She impressed me with her bravery and open mind to the Vesta and its occupants. And speaking of the Vesta, one of the things that is most pleasing about The Dark Victorian series is the acceptance of unconventional relationships. While Art and Jim, two supernatural creatures, find not only acceptance, but friendship, among the staff and residents of the Vesta, it is equally satisfying that the other residents live without "community condemnation or social judgment." 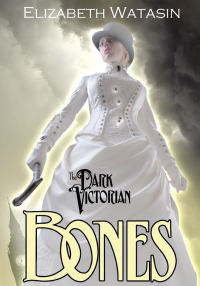 Fans of steampunk will revel in the culture that is The Dark Victorian, while fans of fantasy will enjoy a good mystery laden with supernatural fantasy.